mandy and Patricia suggested the objects to hide in this drawing! can you find: a chickadee, a bluejay, seashell, maple whorls, a poinsetta, a cupcake, a mushroom, a rabbit, a bird's nest, a teacup, a maple leaf, an oak leaf, an acorn, animal footprints, a hand of fatima, and.. well anything else? i am sorry this is a photo not a scan, my scanner is acting up! click on photo and then on all sizes to see larger. i have been crocheting up a storm lately. 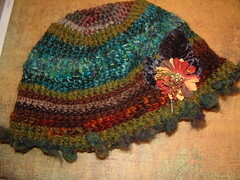 these hats are so much fun to to - it feels like painting with yarn. 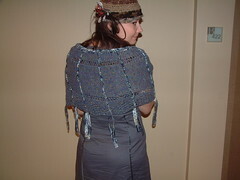 this one is primarily wool - mostly merino which is soft on the skin. several of the yarns are hand dyed or painting, so extra special. I've embellished it with a fabric rose and velvet leaves. 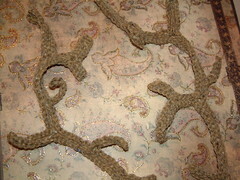 The fancy yarn at the rim has little puffs that frame the face. I've have more of these available after the holidays. this is something i was playing with last night -- while watching the 1994 version of little women and crying. because that's what girls do when they watch little women. 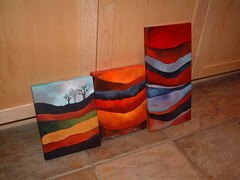 i am, as usual, going for an organic motif, and it will be interesting to see where this takes me. the yarn is some tweed from my yarn hoard. i am not sure what, possibly some rowan or jo sharp. let's see, this one has some lorna's laces worsted, crystal palace taos, some tweed, rowan i think, Madelinetosh tosh worsted, some dune by trendsetter, some jasper by berroco, a little manos wool, and some novelty yarn i forgot the name of. 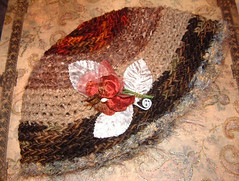 embellished with fabric flower and velvet leaves. today was busy! work, i spent most of the day working on a couple of books. i felt like a blob. so i made myself work out when i got home. then i made stuffed cucumbers for our potluck at work tomorrow and finished this hat for our secret santa exchange. 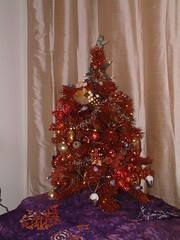 here we have my little copper tree. spent the weekend cleaning, sleeping, crocheting, going to a birthday party, decorating, and eating. it was a good weekend, but i am tired! i think i will go to bed early tonight! i was going for a look in my decorations.. i wanted it to look like it was decorated by little forest creatures, hence the nests, little birds, acorns, pinecones, etc. so that was the look i was going for, decorated by mice, not "decorated by a creature lacking opposable thumbs". 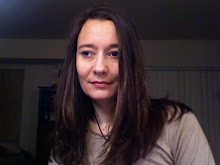 i am blogging this picture from 3 years ago because i want to! 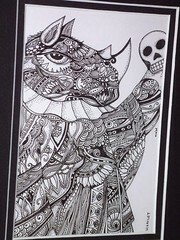 it's a rhino version of hamlet. 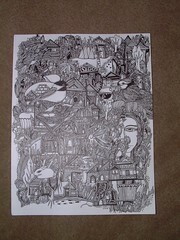 i forgot to scan it before i matted and framed it, as you can see. i do <3 rhinos. it would make a cool t-shirt, too. 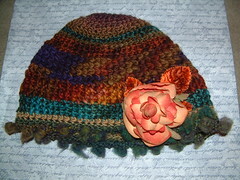 i just listed 2 of my handmade hats on etsy. it was a good weekend.. more later, i think i need to grab a mouse-nap. last night jesse took me out for a nice dinner at pasta bella. i thought i would show you this picture because i am wearing the stress i wore to our company holiday party, and a shawl i knit. it was designed by louisa harding and is called scalla. 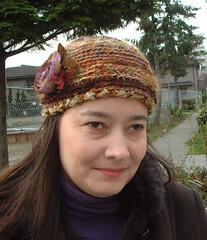 i also crocheted the hat. i am wearing the necklace i made to match the stress, but you can't really see in this photo! i finished my new hat. now i want to make a small army of hats. this one has 2 colors of manos del uruguay wool clasica, 2 colors of jo sharp silkroad aran tweed, and a couple mohairs i am not sure about from my collection of yarns. 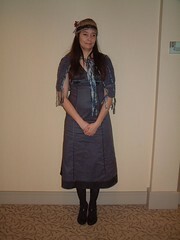 i sewed on velvet leaves and ribbons to give it a little extra something. 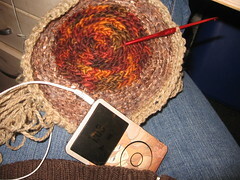 the yarn: Manos Wool Clasica in "Prairie", Jo Sharp Silkroad Aran Tweed in "Twig" and "Russet" and some mohair from stash. the ipod skin is by audrey Kawasaki. Puppet show, Candle Dipping, Felt soap making, Enchanted Cookie Forest, food and drink and all sorts of unique handmade gifts. Kids crafts, a good variety of vendors as well as food and drink. 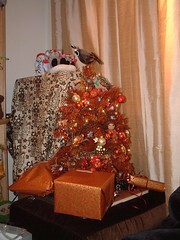 Theresa wanted to see my copper tree! here she is, the sweet little thing. click for more photos. this is LAST year. i need to clean this weekend so i can decorate for this year. 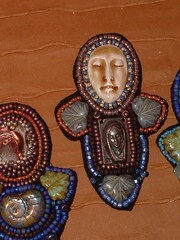 i have been making beaded angels the last few days. the one in the middle is probably my favorite so far. the face is from earthenwood studio. 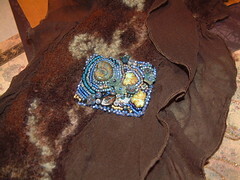 the madonna pendant is a little treasure someone gave me one, from a little jar of treasures. i had no idea how i would use it at the time but things have a way of working out, sometimes. the face on the left is from rama, a company which sadly is no more.